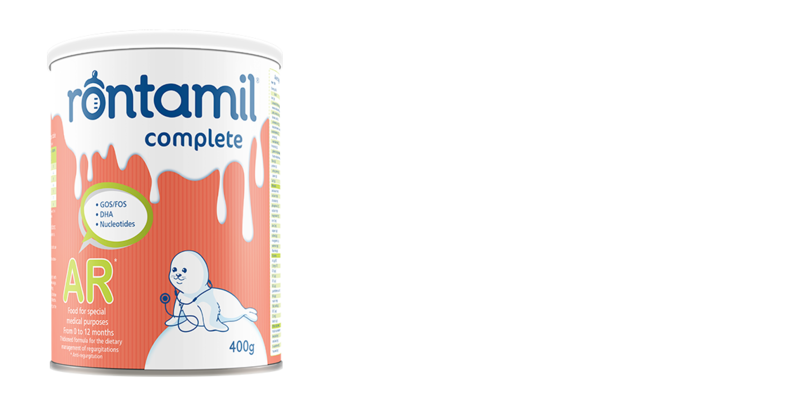 We are delighted to present to you our brand new infant formula, Rontamil AR, which is specifically formulated in order to alleviate common regurgitation symptoms in babies. Regurgitation is a common problem of infants throughout the world, affecting up to half of all babies at 2 months of age. Babies with uncomplicated regurgitation are frequently perceived by their parents as having a problem, and their parents often seek medical attention in about 20% of all cases. According to the Clinical Practice Guidelines for Regurgitations Management in Infants (Joint Recommendations of NASPGHAN and ESPGHAN, 2009), anti-regurgitation formulas are in the first line of defense for the treatment of uncomplicated GER, and are basically formulas that include a thickening agent in order to deal with regurgitations, with a positive effect on the infant’s quality of life and well-being. contains prebiotics (GOS & FOS) to be close to breast milk and also avoid any constipation problems that usually occur with common anti-regurgitation formulas. More new state-of-the-art infant and baby nutrition products are coming soon!! !